...........Climb and level speed performance and position error measurements have been made on Spitfire F Mk.VIII (Conversion) JF.319, the prototype Mk.XIV. This aircraft was fitted with a Griffon RG5SM engine and a 5-bladed Rotol propeller. It is understood that the final version of the Mk.XIV will have a Griffon 65 engine which differs from the engine now installed in having a higher MS supercharger gear ratio. The external features of this aircraft were similar to the production version of the Mk.XIV, except that the shape of the fin and rudder will probably be different. 2. Condition of aircraft relevant to tests. ....2.1 General. This aircraft is basically a Mk.VIII Spitfire with a Griffon RG5SM engine (.51 reduction gear) instead of the normal Merlin. As a result the nose has been extended and the cowling modified accordingly and a larger air intake fitted. Provision was made for an air cleaner element above the air intake, which was, however, bypassed for normal use. ..............cooler radiator in a duct beneath the starboard wing. ...........Universal wings with small bulge over 20mm. guns. ................................"Streamline" blanks over remaining 20mm. gun stubs. ...........Circular rear view mirror with hemispherical fairing above windscreen. ...........F Mk VIII (Conversion) JF.317. ...........Combined rudder balance and trimmer tab. ...........The external surface of the aircraft had been fighly polished to give a glossy finish. ...........Details of the pressure head position are given in Fig.5. ....2.4 Loading. The take-off weight for these trials was 8,400 lb. with the centre of gravity 4.0" aft of the datum (undercarriage down). ...........(i) The position error was measured in level flight with flaps and undercarriage up by the aneroid method. ...........(ii) Partial climbs at combat rating were carried out at mean heights of 9,000 ft. in M.S. gear and 21,000 ft. and 36,500 ft. in FS supercharger, to determine the best climbing speeds. ...........(iii) Six climbs were made at combat rating, two using MS supercharger gear throughout, two using FS supercharger gear throughout, and two combining both. ...........The radiator flaps were fully open on the climbs. The best climbing speed from test (ii) was used. 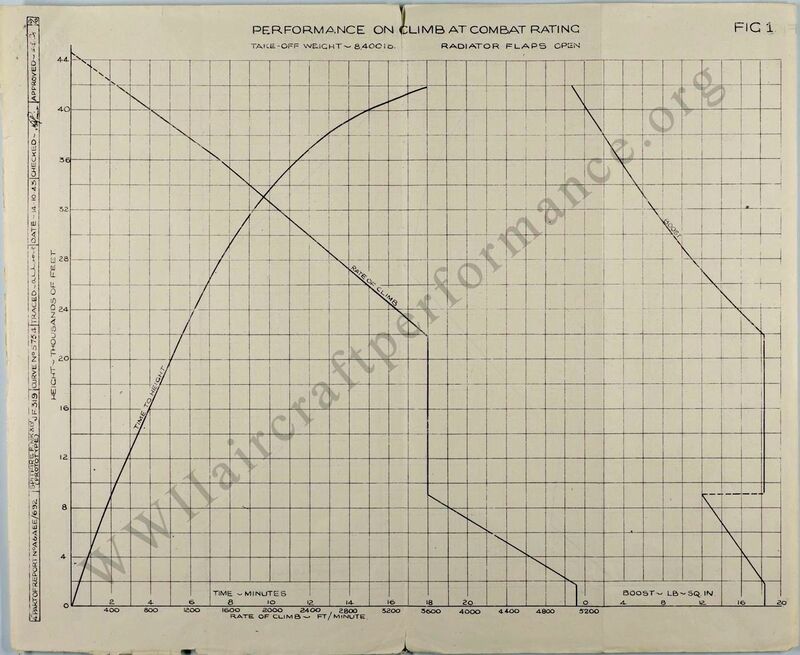 ...........Combat rating is normally permitted for periods of five minutes only, but a concession for test purposes allowed full climbs to be made at this rating. ...........(iv) Level speeds were measured at heights between ground level and 16,000 ft. in MS supercharger gear and between 12,000 ft. and 39,000 ft. in FS supercharger gear with the radiator flap closed. ...........The results have been corrected to standard atmospheric conditions by the methods of Report No. AAEE/Res/170. ...........The level speed results have been corrected to 95% of the take off weight by the methods of the same Report. A 'strut' correction has been applied, the source of this correction being Report No. ARC.6420. The compressibility corrections has been determined by the method given in the Addendum to Report No. AAEE/RES/147. ...........(i) The position error correction varies from -11.2 at 380 mph ASI to +6 at 120 mph ASI being zero at 198 ASI. Full details are given in Fig.3. The altimeter corrections when the altimeter is connected to the static of the airspeed indicator are given in Fig.4. The position error correction curves have been corrected to 95% of the take-off weight, viz. 7,980 lb. ...........(ii) The best climbing speed found from the partial climbs was 175 mph ASI up to 22,000 ft. (approximate full throttle height in FS supercharger gear), decreasing by 3 mph per 1,000 ft. thereafter. Max. rate of climb in MS supercharger gear 5,110 ft/min. at 1,700 ft.
Max. rate of climb in FS supercharger gear 3,600 ft/min. at 21,800 ft.
Time to 10,000 ft. 2.3 mins. Time to 20,000 ft. 5.1 mins. Time to 30,000 ft. 8.35 mins. Time to 40,000 ft. 15.05 mins. Rate of climb is 1,000 ft/min. at 38,900 ft. Estimated absolute ceiling 44,600 ft.
...........(iv) Full results of the level speed tests are given in Table II and Fig. 2. In MS supercharger gear 391 mph at 5,050 ft. In FS supercharger gear 446 mph at 25,400 ft.
...........(i) On the climb at combat rating. Max. rate of climb in MS supercharger gear 5,040 ft/min. at 2,100 ft.
Max. rate of climb in FS supercharger gear 3,550 ft/min. at 22,100 ft.
...........(ii) In all-out level flight. Max. true air speed in MS supercharger gear 391 mph at 5,500 ft.
Max. 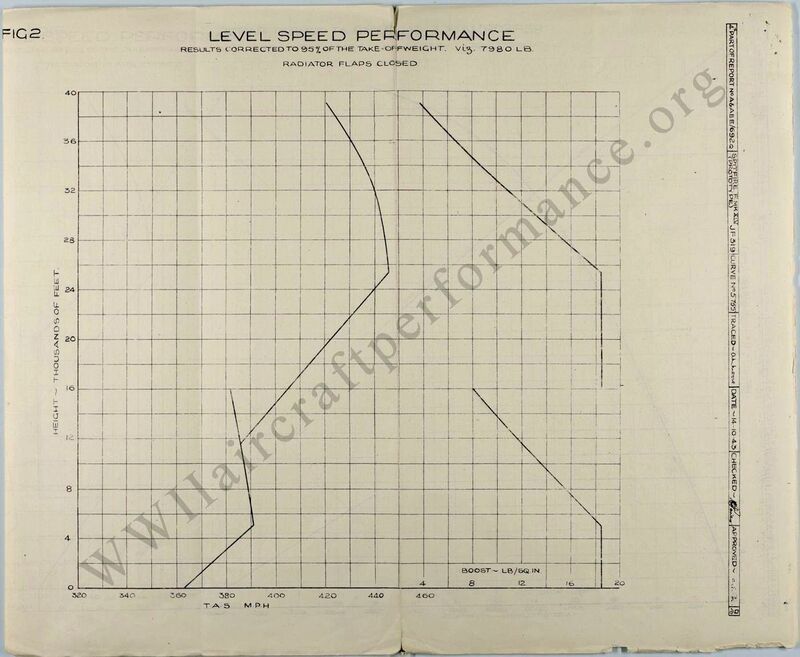 true air speed in FS supercharger gear 446 mph at 25,900 ft.
....5.2 Propeller tip mach number. The propeller tip mach number reached a value of 0.993 at the FS full throttle height, and 1.015 at the highest altitude tested. In correcting the results to standard atmospheric conditions, no corrections for any consequent effects of compressibility on propeller efficiency have been made. ....5.2 Compressibility effects. As already stated the compressibility corrections used in this report were calculated by the methods of the Addendum to Report No. AAEE/RES/147, which includes theoretical effects of position error on the compressibility correction and the variation of position error with Mach No. ...........It is understood that tests have been made in America at high speed and high altitude on an aircraft fitted with both a leading edge and underwing pressure head, and that different true air speeds were obtained from the two ASI systems. This may be due to known effects accounted for in calulating the compressibility correction in this report, or to other compressibility effects due to interference or other causes. Further tests will therefore be made on this aircraft with an additional pressure head located forward of the leading edge to investigate any possible effects of this nature. If these show that the speed results given in this report are not accurate an Addendum giving the revised speeds will be issued. Radiator flaps open S/C gear changed at 9,100 ft.
Sea Level 0.0 . . . . .
4,000 0.8 4640 " +16.4 " "
6,000 1.25 4240 " +14.6 " "
8,000 1.75 3830 " +12.9 " "
12,000 2.85 3600 " " " "
14,000 3.4 3600 " " " "
16,000 3.95 3600 " " " "
18,000 4.5 3600 " " " "
20,000 5.1 3600 " " " "
21,800* 5.6 3600 " " " "
24,000 6.2 3290 169 +15.7 " "
26,000 6.85 2990 163 +13.3 " "
28,000 7.55 2690 157 +11.1 " "
30,000 8.35 2390 151 +9.1 " "
32,000 9.25 2100 145 +7.1 " "
34,000 10.25 1800 139 +5.4 " "
36,000 11.47 1500 133 +3.7 " "
38,000 13.0 1150 127 +2.0 " "
40,000 15.05 810 121 +0.3 " "
42,000 18.25 460 115 -1.3 " "
Estimated Service ceiling 44,000 ft. Corrected to 95% of the take-off weight viz. 7,980 lb. 2,000 374 373 +0.1 -11 +0.1 " " "
4,000 385 374 +0.2 -11 -0.6 " " "
5,050* 391 374 +0.3 -11 -1.0 " " "
8,000 389 357 +0.4 -10.2 -2.2 +15.6 " "
10,000 387 346 +0.4 -9.7 -3.1 +13.6 " "
12,000 386 334 +0.4 -9.1 -3.8 +11.6 " "
14,000 384 322 +0.5 -8.5 -4.5 +9.8 " "
16,000 382 311 +0.5 -7.9 -5.1 +8.1 " "
14,000 396 333 +0.6 -9.1 -4.8 " " "
16,000 405 330 +0.8 -9.0 -5.6 " " "
18,000 414 327 +1.0 -8.8 -6.5 " " "
20,000 423 323 +1.4 -8.6 -7.4 " " "
22,000 432 320 +1.6 -8.4 -8.4 " " "
24,000 440 315 +1.9 -8.2 -9.2 " " "
25,400* 446 312 +2.1 -8.0 -10.0 " " "
28,000 444 297 +2.1 -7.2 -10.4 +15.5 " "
30,000 443 285 +2.2 -6.5 -10.5 +13.2 " "
32,000 440 273 +2.2 -5.8 -10.8 +11.0 " "
34,000 436 261 +2.2 -5.0 -10.7 +8.7 " "
36,000 430 247 +2.0 -4.0 -10.5 +6.6 " "
39,000 421 225 +1.7 -2.4 -10.0 +3.8 " "